[250 Pages Report] The major factors driving the demand for automotive anti lock braking system and electronic stability control systems are stringent safety norms, increased safety awareness, technological advancement, affordability as well as institutions such as the New Car Assessment Program (NCAP) awarding safety ratings to cars based on safety performance. In the coming years, the increasing demand for luxury cars in the regions such as Europe and Asia-Pacific, mainly in China, India and Japan, is expected to drive the market. Sustainable growth in the electronic stability control system and anti lock braking system market will largely depend upon upcoming legislations in various countries. ABS and ESC systems are mandatory in developed countries, while legislations in developing countries are rapidly catching up creating high growth opportunities. This report classifies and defines the automotive electronic stability control system and anti lock braking system market in terms of volume and value. This report provides comprehensive analysis and insights on the ABS and ESC systems (both - qualitative and quantitative). The report highlights potential growth opportunities in the coming years as well as it covers review of the - market drivers, restraints, growth indicators, challenges, legislation trends, market dynamics, competitive landscape, and other key aspects w.r.t. automotive active safety systems market. The key players in the automotive ABS and ESC systems market have also been identified and profiled. The report covers the automotive electronic stability control system and anti lock braking system market in terms of volume and value. Market size in terms of volume is provided from 2011 to 2019 in thousand units, whereas the value of the market is provided in $millions. The automotive electronic stability control system and anti lock braking system market is broadly classified by geography (Asia-Pacific, Europe, North America, and RoW), focusing on key countries in each region. 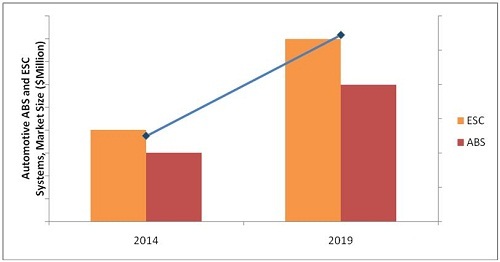 Automotive Anti-Lock Braking System (ABS): The market size, in terms of value, is projected to grow at a promising CAGR of 8.6% to reach $34 billion in 2019. Automotive Electronic Stability Control System (ESC): The market size, in terms of value, is projected to grow at a promising CAGR of 10.9% to reach $42 billion in 2019. The automotive industry, in this era driven by hi-tech innovation, is more inclined to use advanced technologies to reduce crashes and mitigate the impact of accidents on a vehicle’s occupants. Hence, the automotive safety systems play an important role in achieving both targets. These safety systems have evolved from anti-lock braking systems and electronic stability control to driver monitoring and similar systems. These transitions took place due to several reasons such as the increase in awareness of consumers towards safety, rating systems of organizations such as NCAP, and the highly competitive market. These factors prompted companies to invest extensively in passenger safety R&D. In Europe and North America, ABS and ESC systems are well-established and have a high penetration rate. The use of these systems is also growing significantly in the Asia-Pacific and RoW regions, due to the increase in the consumer purchasing power and their preference for better safety measures and the introduction of legislation and policy framework mandating the installation of safety equipment in cars. China, Germany, and U.K., are expected to be the largest market for anti lock braking system and electronic stability control systems. 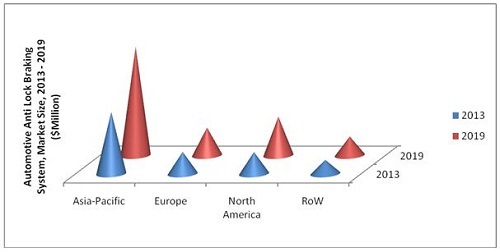 Developing countries such as India, Russia, Brazil, and Mexico are expected to show a high growth rate in the demand for automotive ABS and ESC systems from 2014 to 2019. The global automotive electronic stability control system and anti lock braking system market is dominated by players such as Robert Bosch GmbH (Germany), Continental AG (Germany), Autoliv, Inc. (Sweden), and TRW Automotive (U.S.). Figure 101 Opportunity Analysis for U.S.